Share the post "Rutgers Gardens Receives Prestigious National Horticultural Landmark Award"
American Society for Horticultural Science Landmark award. Photo: Nick Romanenko. 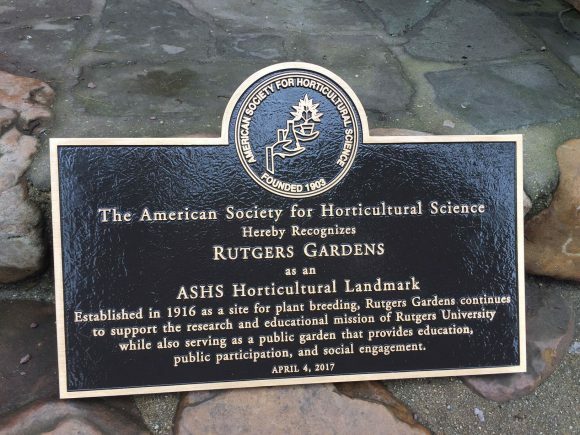 Rutgers Gardens was presented with a Horticultural Landmark Award by the American Society for Horticultural Science (ASHS) on April 4 at the Log Cabin on the grounds of the Gardens. The ASHS president John Dole and ASHS Executive Director Michael Neff presented a brass commemorative plaque to dean Bob Goodman, chairman of the Rutgers Gardens Advisory Board, Bob Lyons, dean of Agriculture and Urban Programs Laura Lawson, and Rutgers Gardens director Bruce Crawford. Through this designation, Rutgers Gardens joins an elite group of horticultural sites like the New York Botanical Garden, the United States Botanic Garden in Washington, D.C., and Monticello, President Thomas Jefferson’s home in Virginia, which received the society’s first Horticultural Landmark designation. 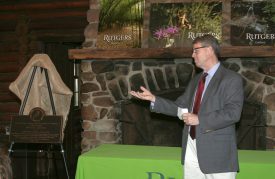 Bob Lyons, chairman of the Rutgers Gardens Advisory Board. Photo: Jennifer Simon. 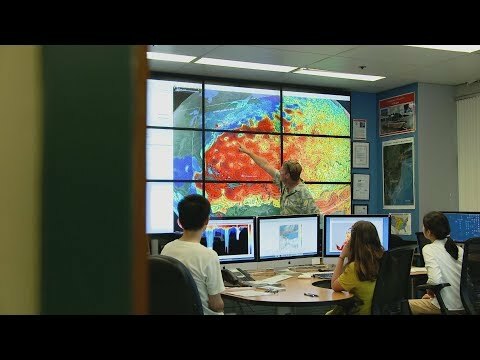 “It certainly raises the profile of Rutgers Gardens as a leading public garden in New Jersey and the region,” he added. A largely self-sustaining operation, Rutgers Gardens is one of the few botanical gardens in the U.S. that does not charge an entrance fee. It hosts a wide range of public activities to help provide support for the care of over 180 acres of both maintained and natural areas.